I use horticultural fleece in the cold greenhouse to protect plants and particularly seedlings from cold snaps. Fleece also shades from excessive sun whatever that is. The fleece allows air and water to pass naturally but has little thermal value for heating soil. I wear a fleece jacket to keep warm when pottering but they are to hot for serious digging. 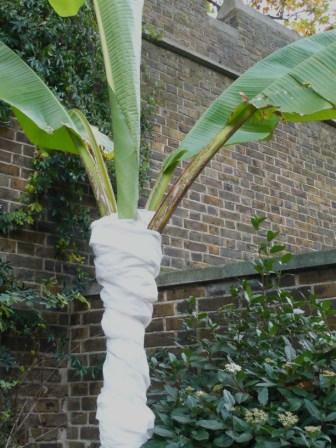 This banana plant at The Garden Museum has had its stem wrapped up for winter in horticultural fleece. you could also wrap your tender specimen plants in a similar way such as Tree ferns or Cordylines. An alternative wrapping is hessian sacks filled with straw or polystyrene but Horticultural fleece is a very useful organic gardening tool. I also use the fleece to cover vegetables from maurauding pests. 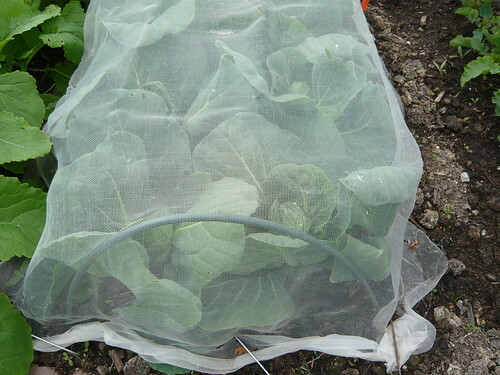 It worked very well on brassicas to keep the pigeons away and insect numbers down. I covered young plants and they grew normally pushing the fleece up as they grew. I had left a bit of slack in the fleece for this purpose but I weighed it down at both ends of the row with a brick. You can make proper fleece tunnels if you wish.